Cambridge, MA. Wednesday, Oct. 28, is the 50th anniversary of the promulgation of “Nostra Aetate,” “Declaration on the Relation of the Church with Non-Christian Religions.” This document has been much discussed over the past 50 years, and written about in the media, Catholic and more broadly. See for instance Fr. Thomas Stransky’s essay, 10 years ago here in America, on how “Nostra Aetate” came about, and very recently, Dennis Sadowski’s report on Pope Francis’ interfaith service at Ground Zero in New York, an event in the spirit of “Nostra Aetate.” At Catholic University in May 2015, I gave a lecture pointing out that “Nostra Aetate” is distinctive even among Vatican II documents, in that it offers a courageously open stance toward other religions that does not dampen its effect by hedging its bold claims with overly cautious qualifications. It is open, and asks us to be open. How can this be? It is because those faiths “by no means rarely reflect the radiance of that Truth which enlightens all people.” And how is that? It is because the church ever announces, Jesus is “the way, the truth, and the life.” (Jn 14:6). To put it in my own words: from a Catholic perspective, Jesus is radiant and alive in whatever paths lead to God, whatever is true, whatever is life giving. As a young man I was inspired by its challenge, and have spent more than 40 years reaching for still deeper levels in the Catholic understanding of the Hindu traditions. It is one of the most enduringly important and influential documents of the Council, and we can rightly celebrate its importance at age 50. But at this anniversary we are also celebrating the intervening 50 years. 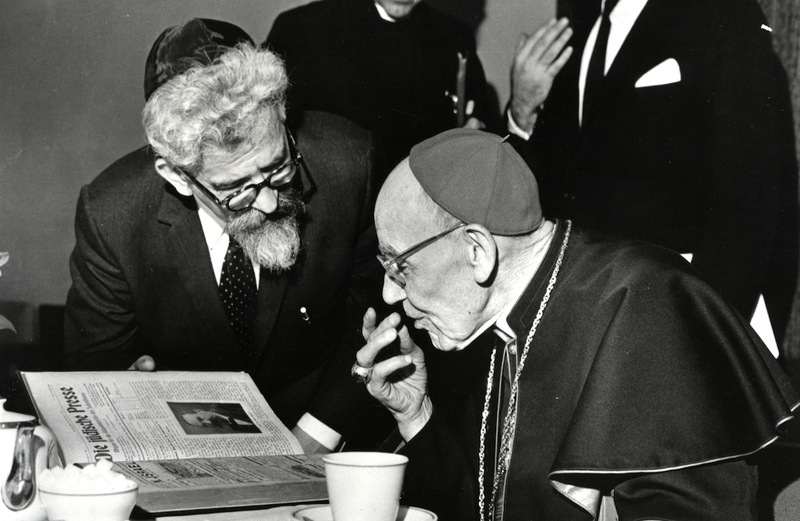 What is most impressive at this anniversary is how it sheds light on the church at its best: not simply the document itself, but the fact that with due deliberation, even if sometimes too slowly, the great ship that is that church has turned itself, in theology and policy, toward this new attitude to people of all faiths. There have been ups and downs, of course, and even today one can find Catholics ill disposed toward other religions, ignorant of them and hostile toward them. Fairly enough, some more judicious Catholics have worried about a slide into relativism—indiscriminate openness—and been cautious to keep a distance from too hasty generalizations and overly optimistic readings of religions (the Christian included). But even the most prudent and enduring of cautions have not stopped the trajectory of the church toward great openness, greater engagement; the church is among the leaders now in the interfaith world, particularly among those seeking to balance fidelity to tradition with interreligious openness. In this place of sorrow and remembrance I am filled with hope, as I have the opportunity to join with leaders representing the many religious traditions which enrich the life of this great city. I trust that our presence together will be a powerful sign of our shared desire to be a force for reconciliation, peace and justice in this community and throughout the world. For all our differences and disagreements, we can experience a world of peace. In opposing every attempt to create a rigid uniformity, we can and must build unity on the basis of our diversity of languages, cultures and religions, and lift our voices against everything which would stand in the way of such unity. Together we are called to say ‘no’ to every attempt to impose uniformity and ‘yes’ to a diversity accepted and reconciled. Given the complexity of the ecological crisis and its multiple causes, we need to realize that the solutions will not emerge from just one way of interpreting and transforming reality. Respect must also be shown for the various cultural riches of different peoples, their art and poetry, their interior life and spirituality. If we are truly concerned to develop an ecology capable of remedying the damage we have done, no branch of the sciences and no form of wisdom can be left out, and that includes religion and the language particular to it” (No. 63). This is openness with credibility; it is openness that is love in the face of extremism, cooperation in rejection of violence against the earth itself. The church changes slowly, but it does change. These 50 years mean that there is no going back, no retreat to polemic. Where will we go in the next 50 years? Surely, the tensions among religions will not dissipate entirely, nor will the push and pull in the church between openness and caution come to an end. But we will learn all the more deeply, decade after decade, that being Catholic and being interreligious are forever more companion realities; being companions of Jesus is forevermore a wisdom that sees Christ wherever there is truth, wherever people are on the way to holiness, wherever individuals and communities are truly alive. And, for all of us hoping for still further changes in the church toward more openness and inclusion, “Nostra Aetate” can be taken as a sign of hope. Change is not to be feared; interreligious openness has not weakened, but strengthened the church. So, too, today: Listening to people in need with respect to their marital status, their sexual identity and their vocations in the church regardless of gender, will in the short and long run strengthen the church. The battles involved may take a long (and even inexcusably long) time; but deep Catholic faith will always in the end honor openness and where it leads. So let us thank God for the Council, and for all those who with perseverance and skill brought “Nostra Aetate” into being! I needed to read this: being a mere three years older than the Declaration, I have always taken this openness and dialogue for granted, and had no idea what a change this was. Regarding those Bishops who opposed Francis at the Synod, he has the numbers in his favor. Francis not only "holds the cards," he is the "House." Francis has appointed 32 Cardinals since February 22, 2014 or about 16 Cardinals a year. 18 of them are younger than 70, and 26 are younger than 80. Francis need only appoint 35 more Cardinals younger than 80 to have appointed 61 Cardinals younger than 80, and he will have appointed a majority of the 120 Cardinals younger than 80 who shall elect a new Pope. It is probable that Francis will reach that number over the next 3 years because 46 current Cardinals are over 85, and 22 of those are over 90. The probability that some of these Cardinals sadly may die over the next few years is relatively high, and Francis shall appoint their successors. Francis may also create new Cardinals in places where none currently exist because he already has done this 5 times. Francis also has been and shall continue to appoint Progressive Bishops and Archbishops, as he just did with Fr. Zuppi in Bologna and Fr. Lorefice in Palermo, some of whom he shall elevate to Cardinals. Finally, if Francis is Pope another 5 years, then 46 of the current Cardinals, who were NOT appointed by Francis, shall be over 80 and unable to vote for a new Pope in 5 years. In 5 years, only 44 of the current Cardinals, who were NOT appointed by Francis, shall be younger than 80 and still be able to vote for Francis' successor; and many of them are Progressive because they voted for Francis as Pope. Therefore, Francis' successor shall be as Progressive as, or more Progressive than, Francis. It is written in the numbers. Francis not only "playa the game," he decides who "playa the game" after him.